Guys are lucky in a way because from a young age they are conditioned to carry a wallet, every day, in their pants pocket. They are in the routine of carrying something with them, every day. A man’s wallet many times becomes a part of him, something he never leaves home without. For women routine more likely includes a purse, sometimes with a wallet or coin purse that is kept inside. But whether you are male or female, a wallet can be an essential part of the EDC kit. Yes, your wallet needs to hold your cash, ID, and credit cards, but with a bit of creativity, a good EDC wallet can carry many other items for survival as well that the other bags can’t or shouldn’t. These items that you keep on your person at all times make up your EDC kit. Consider items from this EDC megalist for your EDC kit. The goal of such a kit is that if you are stranded, with (nothing to assist you such as a BOB or a get home bag), you’ll be able to signal for help or get to safety using the essential EDC items for wallets and pockets or elsewhere on your person. The second thing most preppers look for is a wallet that is sturdy and well-made. A good quality wallet means that you won’t have to be searching for a new wallet in a couple years and it can even mean that you will have a well-loved heirloom for the next generation. 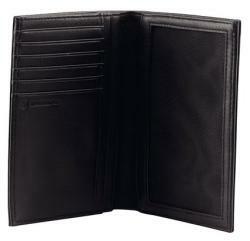 Many prefer a wallet made of genuine leather or other natural material with solid stitching. New generation or modern preppers may see the value in having a hard sided wallet made of tough polycarbonate or other material and sturdy clasps or hinges. One of the crucial things about a good EDC wallet is its capability for efficient storage of your most needed items. Some preppers prefer a minimalist wallet, that holds cash and credit cards, maybe an ID. They keep the other components of their EDC kit on their keychain or in a pants or shirt pocket. Some preppers prefer a wallet with lots of extra space to hold additional EDC items such as a SAK, pen, mini-flashlight, and some basic first aid or fire starting tools. Getting things that you need in and out of your wallet is something you do frequently on any given day. Most people prefer a wallet that provides easy access to items inside. Credit cards that can be taken out and put back quickly and a secure place for currency are two must haves for most people. For those who reside in an urban area, there are literally hundreds of wallets to choose from on the market today. We’ve listed several of those that are more popular with urban preppers below. In an urban area, help in some form is never too far away so your wallet may not need to hold as much. If you intend to carry just your credit cards in your wallet and simply carry a few other EDC items on your keychain or in your pockets, you can also consider one of the many, many “minimalist” wallets that are on the market. Those preppers who live in a more rural area may have different EDC needs than those who live in the city. Living in a more rural area may mean that you work outdoors more frequently and are doing more physical work, getting on/off farm equipment, fixing fences, tending to livestock, or even riding horses on a daily basis. You may be further from home and from some type of help and may be in a more isolated area when something goes wrong. Therefore, it’s important for your wallet to carry a wider array of EDC items for signaling, fire starting, etc. The final thing to consider when searching for the perfect EDC wallet for you will be the cost. Most preppers are willing to pay more for a high quality wallet because they know that it will last them for many years. Before buying a lower priced wallet, make sure that you research reviews from users and inspect the stitching and closure mechanisms to ensure they will hold up to daily wear and tear. If you take all these things into consideration, you should end up with an EDC wallet that will be right for you.